Ferrari 458 Hood with Film applied waiting to be installed. Clear bra installation is an extremely time consuming and meticulous process – the film is thick, extremely fragile to handle (when uninstalled) and difficult to contour 3-dimensional shapes. It has taken us years, chemicals, solutions, manufacturers & thousands of feet of film to learn to install properly. Essentially, we are stretching and installing an extremely durable film about 8mil of an inch thick over your paintwork. Your total paint thickness (primer, base coat & clearcoat) is generally 5-7mil of an inch thick. This film has an extremely aggressive adhesive & when left for years forms a semi-permanent bond to the paint – to ensure ZERO lifting, peeling, shrinking or cracking. 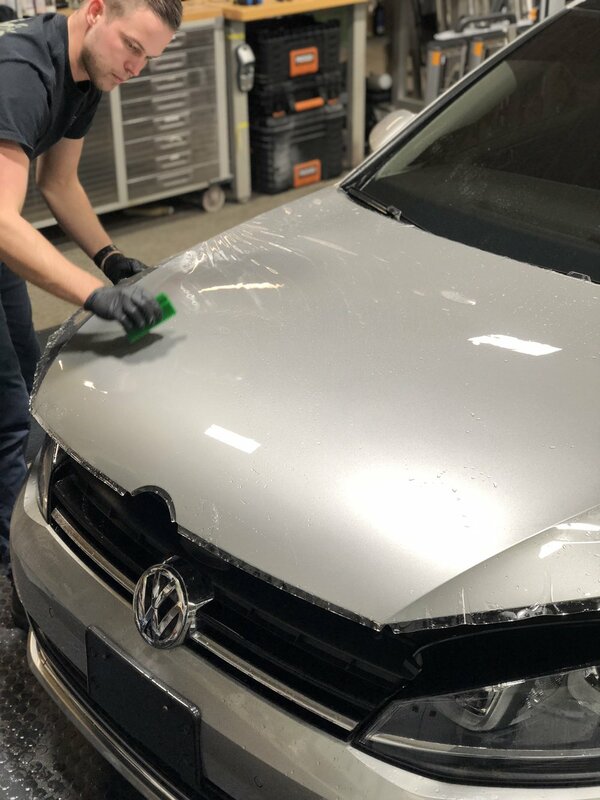 Clear bra has been around for decades, but in the past 5 years or so – the use of TPU Film or “Thermo-Plastic-Polurethane” Film has allowed installers like us to lay this self-healing, extremely clear film – and manipulate it to protect the varying contours of your vehicles exterior body panels. This new technology, costs us nearly 5x as much as traditional film – but the results are worth Every.Single.Penny. Traditional PVC film is rated for about 2 years – but commonly is left for much longer – until it becomes a cracking, yellow, peeling mess. These problems are completely irradicated with TPU films – like the ones that we proudly install. Installer using squeegee to remove installation solution under neath the film - this bonds the film to the body panel. Understanding what PPF is, and how it is installed is important in regards to how it will look on your car. Every part of the installation process is done with the utmost care and preparation – starting with a full wash, degreasing & decontamination of the vehicles exterior body panels where the film is to be installed. Cracks, Crevices, Nooks & Crannies are cleaned – where dirt is trapped, that may cause contamination in the film during the installation process. Following this is a very thorough drying and Isopropyl alcohol wipe down to ensure a completely clean and residue free surface. Once the vehicle has been prepped, it is pulled into our clean room which is specifically designed for the installation of Film. The room, climate controlled and completely separated from our detail shop – ensures that no in air debris can be trapped between the film and body panel during installation. Next – all of the film is cut using an extremely accurate and tediously-designed film cutting program on our top of the line Graphtec Plotting system. This machine cuts the film to the exact measurements of your body panel – ensuring NO cuts are made on the exterior of the car – risking your paint to nasty strike-throughs. The film is then carefully installed and manipulated to fit – through the utilization of many different solutions, a few different pieces of equipment & some very talented hands – one may add..
During an advanced install – which can be requested by a customer for an additional fee – body parts & panels can be removed for a completely seamless installation. Front bumper covers & headlights are commonly removed for a totally seam-free finish. 2018 Porsche 911 GT3 after full front PPF. We go head over heels to provide a completely defect free finish – but there are certain imperfections that either must be addressed – or understood once PPF is laid upon them. All cars – even new cars have imperfections, chips, & scratches that either must be leveled and polished before PPF is laid. This can be a very tedious and time consuming process – and is not included “standard” with every PPF installation. Correct paint touchup may take DAYS not *hours* to fully fill, level and correct. Each install we put our stamp on is fully heated to ensure a proper bond before delivery – but it is important to let the film completely dry, shrink, contract and expand for about 2 weeks after your installation before a heavy wash. Waxing & Polishing is a thing of the past – because your film has a built in hydrophobic top coat that is warranted for up to 10 years. It’s Self Healing too - So no more swirls - ever. The end product results in a finish that is completely unidentifiable & contains copious amounts of gloss, while duplicating factory texture and clarity. On some paints, the film even looks better than the original paint’s texture/finish.